Microsoft shares rose in after-hours trading Thursday after the company reported solid results for the first three months of the year -- CEO Satya Nadella's first quarter. 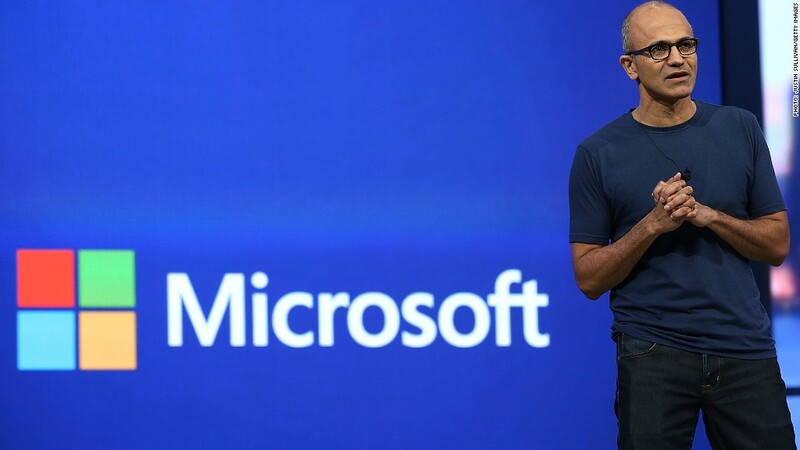 Satya Nadella's tenure as Microsoft CEO is off to a solid start. Microsoft's profit and sales slipped slightly as the broader PC market continued to decline. But Microsoft (MSFT) managed to beat Wall Street's too-dire earnings expectations, sending shares up more than 2% in after-hours trading Thursday. Nadella was named CEO in February after overseeing various aspects of the company's corporate software business since 1992. He was most recently in charge of Microsoft's cloud and enterprise group, overseeing the company's server software and back-end technology for corporate customers. Microsoft tapped Nadella for his expertise in the company's businesses outside of Windows for consumers, which is losing popularity amid the shift to tablets and smartphones -- and away from Windows PCs. Those businesses look fairly healthy. Microsoft booked solid growth from business products like its Office 365 software and Azure cloud computing application. Sales of the corporate version of Windows rose 19%. "From Day 1, I've had the conviction that our vision is about going boldly into this mobile-first, cloud-first world," Nadella said on a conference call with analysts Thursday. "We participated in the PC market. Now we're in a market that's much bigger than the PC market." Overall, Microsoft posted $20.4 billion in revenue for the first three months of the year, down incrementally from a year ago. Microsoft's $5.7 billion in profit was 6% lower than during the same period in 2013.